Durable and stable solid wood construction ensures the longevity of the piece while the natural, dark wood finish gives it a rustic look. Material: Rubberwood. 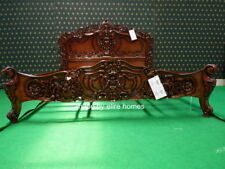 1 x Headboard. Type: Panel Bed. Key Features. All our products are made from Grade A or B Solid Mahogany or Teak wood. ( Finish colour dark mahogany / our trademark shadow finish ). Finish colour :Dark Mahogany ( our trademark shadow colour ). Size : 181x201cm UK Super King size. 308 3423 24. Wood Type: Distressed Waxed Pine. PINE DRAWER RUNNERS. DRAWER SIZE W810 D425 H185. DRAWER FRONT W840 H200. TOP SHELF SPACE W940 D515 H275. HANGING SPACE W940 D515 H1080. DOOR SIZE W420 H1390. All our products are made from Grade A or B Solid Mahogany or Teak wood. Finish colour : Choice of Dark Mahogany or Our Trademark Shadow. In addition to our products, we also specialize in custom-building furniture to fit your exact specifications. We are able to reproduce any discontinued products, hard to find products, or those that are no longer available elsewhere. Finish colour : Our Trademark Shadow effect finish. We specialize in custom-build furniture. All our products are made from Grade A or B Solid Mahogany or Teak wood. We are able to reproduce any discontinued products, hard to find products, or those that are no longer available elsewhere. Finish colour : Our trademark Shadow colour. All our products are made from Grade A or B Solid Mahogany or Teak wood. We are able to reproduce any discontinued products, hard to find products, or those that are no longer available elsewhere. Finish colour : Dark wood tone. 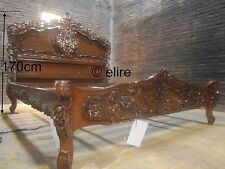 Mahogany french Rococo Bedframe 170cm high Headboard, matress size 76"x80"
All our products are made from Grade A or B Solid Mahogany or Teak wood. Finish colour : Mahogany with shadow effect. Size : 194x204cm. What we have for sale is In addition to our products, we also specialize in custom-building furniture to fit your exact specifications. We are able to reproduce any discontinued products, hard to find products, or those that are no longer available elsewhere. Finish colour : Silver / Grey. Silver finish colour with Silver Velvet Upholstered Headboard. All our products are made from Grade A or B Solid Mahogany or Teak wood. We are able to reproduce any discontinued products, hard to find products, or those that are no longer available elsewhere. Finish colour : As seen on the image. All our products are made from Grade A or B Solid Mahogany or Teak wood. Inspired from Ralph Lauren Victoria Falls Bed. If you have been thinking of the concept of a sleigh bed, then I don't know if you'll be able to find anything more interesting than this one, it's simply extravagant but oh so stylish! All our products are made from Grade A or B Solid Mahogany or Teak wood. We also have matching NIGHTSTANDS DRESSING TABLE STOOL AND MIRROR and CHEST OF DRAWERS for this bed which we can list with buy it now. All our products are made from Grade A or B Solid Mahogany or Teak wood. Finish colour : We have our trademark Shadow or Antique Dark Mahogany available to choose from. Pictures showing the actual design in different colours. All our products are made from Grade A or B Solid Mahogany or Teak wood. We are able to reproduce any discontinued products, hard to find products, or those that are no longer available elsewhere. Finish colour : As soon on the image. All our products are made from Grade A or B Solid Mahogany or Teak wood. Finish colour : Our Trademark Shadow colour ( Dark Mahogany ). 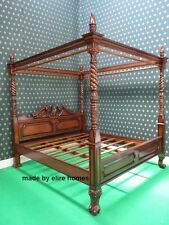 Mattress size : 181x201cm 6 foot UK Super King Size. Here to help you. All our products are made from Grade A or B Solid Mahogany or Teak wood. Made from 100% Solid mahogany wood. Finish colour : Dark Mahogany. We will build your dream bed. It will be made exclusively for you !